For as long as he could remember, Detective Charles Street wanted to be a police officer, moreover a detective. He wanted to be knee-deep in the action, working the biggest cases, and reaping the biggest rewards. But he didn’t think when his dream job came calling that it would ever turn into his nightmare. For as long as he could remember, Jack Casey just wanted to be free, his own man to do what he pleased, when he pleased. He too craved action, and when his dream life came calling, he didn’t think he would meet anyone who was his equal, and definitely didn’t think he would ever have difficulty leaving behind the world he loathed and mocked. As the ultimate cat and mouse game unfolds, each has to deal separately with the other’s decisions and the effects they have in turning their lives sideways and upside-down. Will one of them crack? Will one of them succeed? Ultimately, the journey may mean more than the game, and show both of them the outcome neither was ever expecting. Amongst the Killing is an interesting book offering two perspectives, that of Detective Charles Street, and that of Jack Casey. Both men couldn’t be more different, yet in some aspects, they’re eerily similar. Jack Casey is a serial killer, a man who longs to be free, free of the rules society pushes upon all of us, free to do what he wants to do and when he wants to do it. Detective Street is the man hunting him, the man who always wanted to be a detective and saw his dream job turn into a nightmare after meeting Casey, after doing everything he could to catch him. The book starts out promising, with a first chapter that opens up straight into the action. Then the book races on, and in the next chapter we first meet Jack Casey. I found him the most interesting of both characters, especially since he acts unlike other human beings, yet one can relate to him sometimes as well. Detective Street was interesting too. The chapters switch from one character’s POV to the other, but I didn’t mind – it felt that, if anything, it made the book even more suspenseful. 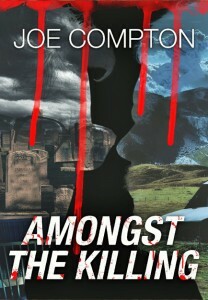 Thriller fans will love this book. I enjoyed the writing style, the characters, and the plot. Thank you for the review Majanka and all you have done for this book, it means the world to me!